Preface. Acknowledgements. Contributors. Chapters: Visual Direction Constancy: Perceiving The Visual Direction Of Perisaccadic Flashes (W.A. Hershberger, J.S. Jordan). Contextual Factors In Scene Perception (H. Intraub). 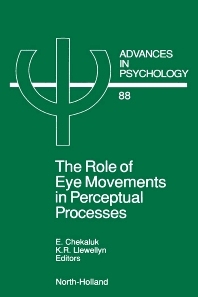 Eye Movements And Perceptual Multistability (M.A. Garcia-Perez). The Role Of Eye Movements In Reading: Some Limitations Of The Eye-Mind Assumption (G. Underwood, J. Everatt). Saccadic Suppression: A Functional Viewpoint (E. Chekaluk, K.R. Llewellyn). Mechanisms Underlying Saccadic Suppression in Specifically Disabled And Normal Readers (W. Lovegrove). Response Characteristics of Midbrain Neurons Related to Vergence Eye Movements (J.W. Morley). Eye Movements: Developmental Aspects (S.L. Shea). Subject Index. Author Index. It has become a truism that the frozen optical diagram representation of vision is the worst possible picture of the way in which we visually interact with the environment. Even apart from our reaction to moving targets by pursuit movements, our visual behaviour can be said to be characterised by eye movements. We sample from our environment in a series of relatively brief fixations which move from one point to another in a series of extremely rapid jerks known as saccades. Many questions arising from this characteristic of vision are explored within this volume, including the question of how our visual world maintains its perceptual stability despite the drastic changes in input associated with these eye movements.